It is bursting with history and endemic wildlife. This is an experience like no other if you want culture and something truly different. Two airlines fly daily from South Africa to the capital Addis Ababa and this is a five hour plus flight. Addis Ababa is probably the best African hub for onward flights to the Middle East, Asia and Europe and surrounding African countries. It has its moments bearing in mind it borders Eritrea and Somalia. When you travel to the tribes in the South there are stricter security measures. Crime is of the petty kind in the major towns and you will be harassed by urchins and beggars. This is a sad reality of a country that has gone through numerous famines and civil wars. The sky is the limit. Starting off with rock hewn churches, 17th century castles, the Simien mountains, national parks, authentic african tribes, abundant bird life, the Great Rift Valley, archeological sites, endemic wildlife, monasteries, bustling markets. Ethiopian food is quite unique. The traditional food is a pancake like bread called Injera served with a stew called wat. In every town there will be small restaurants offering Italian cuisine, a kick back from the Italian occupation years back. You really should consider a fully organised trip when planning to visit Ethiopia. There are no five star hotels in the outlying towns so the experience makes up for the accommodation. Addis Ababa has world class hotels hosting many international conferences each year. Self drive is a no no, the traffic is manic and the road infrastructure is not ideal. We prefer that you are in the safe hands of our groundhandler and hoteliers. All visitors need visas and it is probably better to obtain your visa prior to departure. Visas can be issued on arrival and this can be a lengthy procedure. 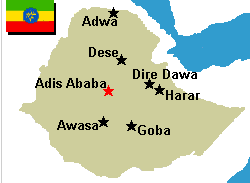 Amharic is the official language and English is widely spoken and understood. Yellow Fever is a must! The officials are very strict with this. There is malaria in the low lying areas so please take precautions. Bottled water is essential so don’t drink the tap water. Harar (feeding the hyenas), Trekking up the Simien Mountains with mules, seeing the Gelada Baboons, spotting the Ethiopian Wolf, experiencing the cultures associated with the southern tribes. See all the brightly coloured paintings in the churches and castles. Visit St Mary's Church where the Ark of the Covenant is supposedly housed. See the ruins of the Queen of Sheba’s palace. Stand in awe of the Stellae. Visit the museums in Addis Ababa.